Miami Trace junior Kyler Conn (30) puts up a shot during the Frontier Athletic Conference opener at Chillicothe High School Friday, Dec. 7, 2018. Pictured for the Cavaliers are (l-r); senior Josh Howard (1) and sophomore Kam Smith. CHILLICOTHE — Both teams were coming off disappointing losses as they entered the game Friday night. The Chillicothe Cavaliers took a loss against the Zane Trace Pioneers and Miami Trace had lost its previous game to Logan Elm. Both were looking to get off on the right foot as they opened play in the second season of the Frontier Athletic Conference. Chillicothe showed why many pick them to repeat as conference champions as they posted a 67-39 victory over the Panthers. Six-foot, seven-inch junior Brandon Noel was the game’s leading scorer for Chillicothe with 25 points, including four slam dunks. He also led his team in rebounds with seven. Junior Tre Beard had 11 points and junior Jayvon Maughmer scored nine to go along with six rebounds and a team high five assists. For the Panthers, junior Cody Brightman led with 12 points. Junior Gabe Arazo had nine points and senior Austin Brown had eight points and had a game-high eight rebounds. The game was tied early on, 2-2. From that point, Chillicothe went on a 17-2 run to take a 19-4 first quarter lead. That streak carried over into the second quarter and ended up being a 31-2 run for the Cavs. Austin Mathews ended the run for the Panthers with a basket at the 4:08 mark of the second quarter. Two points from Brown, two from Brightman and a three-ball by Arazo put the score at 33-13 with 1:28 to play until the half. Chillicothe scored the last four points of the half to lead 37-13 at the intermission. The Cavaliers went on another run to open the lead even further in the third quarter. The home team led 59-24 after three quarters. Miami Trace outscored Chillicothe 15-8 in the fourth quarter to put the final tally at 67-39. “Historically, this is always a difficult place to win in our league,” Miami Trace head coach Rob Pittser said. “Every team in our league will have a hard time coming in here and getting a win. “Again, we’re playing a lot of young kids that are just getting their feet wet in varsity basketball,” Pittser said. “We’re going to be a drastically different team in another four or five weeks than we are right now. 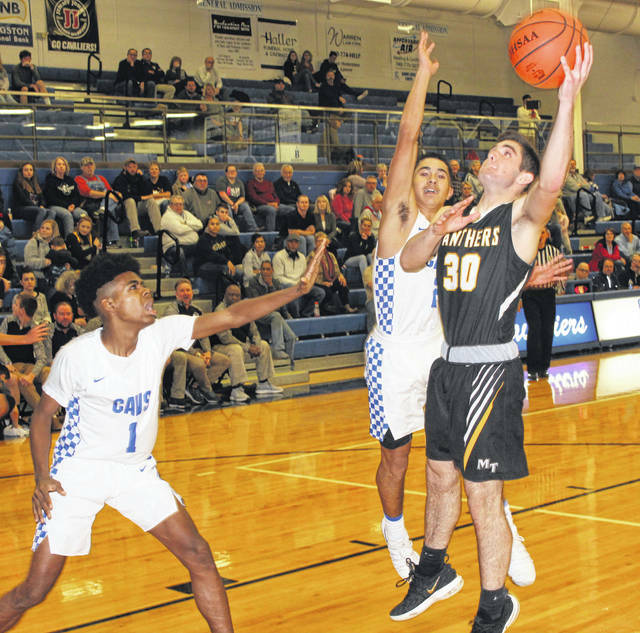 “Tuesday (the loss to Zane Trace) is still disappointing,” Chillicothe head coach Eric Huffer said. “Wednesday in practice, we just focused on being tough. We watched film, we lifted and we practiced hard for an hour and a half. We got after it (Thursday). We didn’t treat it like the day before a game. We went hard. (Tuesday) was something we can continue to learn from. Miami Trace (0-3 overall, 0-1 FAC) will play its home opener in the Panther Pit, taking on the McClain Tigers Tuesday with the freshman game starting at 4:45 p.m.
Chillicothe (3-1 overall, 1-0 FAC) will play at Washington High School against the Blue Lions Tuesday with the j-v game starting at 6 p.m. Elsewhere in the FAC Friday, Washington (2-1, 1-0) won at Hillsboro (2-2, 0-1), 67-53 and McClain (4-0, 1-0) edged Jackson (2-1, 0-1) in a game played in Greenfield, 50-48. MIAMI TRACE — Cameron Moore 1-0-2; Austin Mathews 2-1-5; Dylan Bernard 0-0-0; Gabe Arazo 3 (1)-0-9; Braden Osborne 1-0-2; Cody Brightman 5-2-12; Kyler Conn 0-1-1; Austin Brown 4-0-8; Logan Rodgers 0-0-0. TOTALS — 16 (1)-4-39. Free throw shooting: 4 of 8 for 50 percent. Three-point field goal: Arazo. Field goal shooting: 17 of 49 for 34 percent. Three-point field goal shooting: 1 of 10 for 10 percent. Rebounds: 28 (7 offensive). Assists: 10. Steals: 2. Blocks: 2. Turnovers: 15. Personal fouls: 8. Bench points: 23. Second chance points: 2. Points off turnovers: 7. CHILLICOTHE — Josh Howard 0-0-0; Kam Smith 1-0-2; Tre Beard 2 (2)-1-11; Vincent Roper 1-1-3; Courtland Duncan 1 (1)-0-5; J’Quan Harris 0-0-0; Joel Barnes 0-0-0; Brandon Noel 12-1-25; Kaden Riffe 0-0-0; Jayvon Maughmer 2 (1)-2-9; Eli Taylor 1-0-2; Chris Postage 2 (1)-2-9; Lucas Crawford 0-0-0. TOTALS — 22 (5)-7-67. Free throw shooting: 7 of 10 for 70 percent. Three-point field goals: Beard, 2; Duncan, Maughmer, Postage. Field goal shooting: 27 of 56 for 48 percent. Three-point field goal shooting: 5 of 21 for 23 percent. Rebounds: 30 (8 offensive). Assists: 14. Steals: 7. Blocks: 1. Turnovers: 8. Personal fouls: 6. Bench points: 10. Second chance points: 10. Points off turnovers: 17.